Greetings from the team at Hilton International College. PAY NO ENROLMENT FEE!!!! Take $150 off attached package prices. Fun, Adventure, Excitement, New Friends, Culture and SUN! English & Island Adventure - All inclusive packages from 1 week. 'Meet the Dolphins' on the second largest sand island in the world, Moreton Island. Stay overnight and enjoy the fantastic facilities at the gorgeous Tangalooma Wild Dolphin Resort. Relax by one of the many pools, take a dip in the tranquil blue waters, enjoy resort diving or a 4WD safari to one of Moretons beautiful fresh water lakes. Whale watching is also avilable in late June to early September. English & Island Adventure English & Learn to Surf - All inclusive packages from 2 weeks. South East Queensland has a tepid annual water temperature of 22 degrees celcius. Surfing is a fun and exciting sport open to people of all ages. Beginners to seaoned surfers can learn with some of the most professional surf instructors in the region. 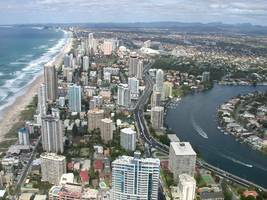 All courses are certified and include transfers and overnight accommodation on the Gold Coast. English & Scuba Diving - All inclusive packages from 2 weeks. Enjoy learning to scuba dive with PADI 5 star professionals on some of the most amazing dive sites in the world. This course can be taken from just 2 weeks and involves a range of pool, snorkeling and ocean diving lessons. Hilton International College had its humble beginnings in 1989. It has since become a reputable provider of education to all students and is a distinguished member of several industry groups. HIC's reputation has been built on the three pillars of diversity, flexibility and choice and which has been its hallmark since its very existence. The college offers a wide range of secondary, tertiary and vocational study options that prepare students for further study, work or for other reasons. HIC has a diverse international student body and this is reflected in its international student enrolment from more than 41 countries. This fact upholds the college's multicultural ethos. HIC is an inner city educational institution and is therefore well serviced by public transport. The city also offers public recreational facilities. Many international students choose to undertake study with work opportunities. The reasons may vary from some extra money to valuable work experience gained. The tourism and Hospitality sector is Brisbane and South East Queensland is particularly alluring because of the booming tourism industry and the endless opportunities it offers. English skills and self-confidence are some of the attributes that are highly sought after by employers. The Hotel Training Association of Australia (HTA) and HIC offers English language courses that are complemented by practical hspitality skills training to meet the demand in this sector. Hilton International College (HIC) had its humble beginnings in 1989. It has since then become a reputable education provider and is a member of many distinguished industry groups. Hilton caters for all students and its courses reflect diversity, flexibility and choice. Courses at HIC are tailored to meet the special needs of students and all teaching staff hold excellent credentials in their field of expertise. The standard of teaching is second to none. Hilton offers secondary, tertiary or vocational courses that are tailored to the special requirements of students. Be it work, study or just plain fun, HIC has the course just right for you. This flexibility offers students greater choice. HIC has a diverse international student body reflecting the multicultural ethos of the college. More than 41 countries are represented in the student body. Hilton is in the heart of Brisbane city. It is a vibrant backdrop for experiencing the diversity that Australia has to offer. Nationalities of all kinds are to be found in Brisbane and they are highly visible and part of the city's cultural mosaic. Students may even find people of their own nationality to meet and build friendships with.